Rosselba le Palme is a luxury camping site located in a beautiful corner of Elba Island. Mesmerising coastal landscapes, ancient castles, hilltop towns, and a laid-back atmosphere make this area one of Italy's best kept secrets. If this sounds appealing, speak to the camping holiday specialists at Lux-Camp and get ready to enjoy a luxurious island break. 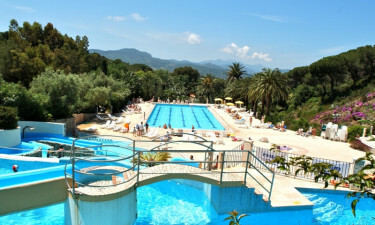 Why should I choose Rosselba le Palme for my holiday with Lux-Camp? Beautifully designed spaces that offer privacy, comfort, and the best opportunities for relaxation. The campsite is ideally located to offer easy access to the island's top landmarks. 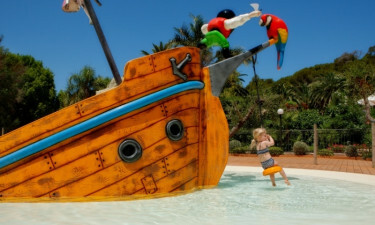 A friendly and multilingual animation team and excellent recreational facilities will keep guests of all ages entertained. A vast range of luxury accommodation options. Luxury tents, sumptuous villas, bungalow tents, mobile homes, and safari tents are just some of the options available. Rosselba le Palme has a spectacular setting right in the heart of the Ottone Botanic Gardens. Take your time to wander around exotic trees and fragrant flowers while you enjoy panoramic sea views. Relax under the sun at nearby beaches like Sansone, Bagnore, and Seregola, or watch the sun go down from the breathtaking cliffs at Capo Bianco. A gym and sports facilities are also available, and watersports lovers should not miss the on-site diving centre, which offers dives to the island's marine reserves. For a complete luxury camping experience, visit the on-site restaurant to sample authentic Tuscan specialties in a lovely setting. In the evenings, you can enjoy a glass of wine at the beach bars near Scaglieri, or order your favourite cocktail at the campsite's poolside bar.